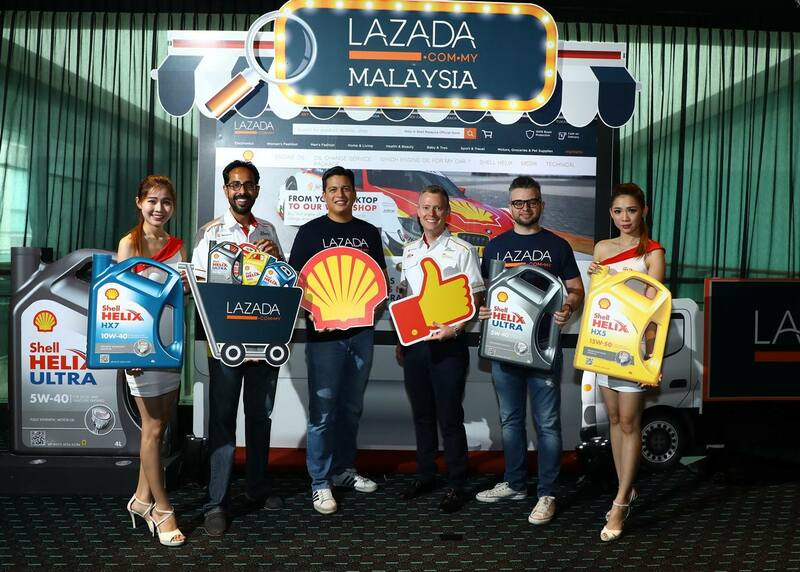 Shell Malaysia Trading Sdn Bhd launched the first official Shell online store on Lazada Malaysia on 3 August 2017, in a move that makes genuine Shell Helix motor oil more easily accessible to car owners across Malaysia. Consumers get to purchase officially-sourced and original Shell Helix products, while the prices include delivery across Peninsular Malaysia, Sabah and Sarawak. Apart from Shell Helix products, the Shell Malaysia Official Online Store also offers value for money engine oil service packages at selected authorised workshops in the Klang Valley and Johor. These all-inclusive packages, which start from RM103, include the preferred Shell Helix motor oil, oil filter, labour and a complimentary 15-point vehicle check. In conjunction with the launch, shoppers at the Shell Malaysia Official Online Store will get an e-voucher from Lazada Malaysia worth up to RM30 for every purchase of Shell motor oil or oil service packages from August 3 till 10, 2017. If you purchase an engine oil service package from the Shell Malaysia Official Online Store, the official Shell distributor will contact you to arrange your preferred service venue, date and time slot followed by a confirmation via SMS. The store also provides access to product technical support to those seeking guidance on the Shell Helix motor oil that is best suited for their cars. According to Shell Lubricants Executive Director – Southeast Asia & Oceania, Troy Chapman, Malaysia was the first market in Southeast Asia to enable online purchase of genuine Shell Helix products and service packages from an official channel. “This is yet another initiative from Shell, which explains why we have been the number one lubricant supplier in the world for the past 10 consecutive years. We were the first motor oil brand to offer the Shell Helix Engine Warranty or S.H.E.W last year. Today, we are proud to be the first oil and gas company in Malaysia to have an official presence on a leading e-commerce platform such as Lazada Malaysia. This initiative would help expand our market coverage and reach significantly and complement our extensive brick and mortar network in this country, which has been built over the past 125 years,” he said. Lazada Malaysia Chief Executive Officer Hans-Peter Ressel said that the company was thrilled to welcome Shell, a reputable global brand, onto its well-established e-commerce platform in Malaysia. 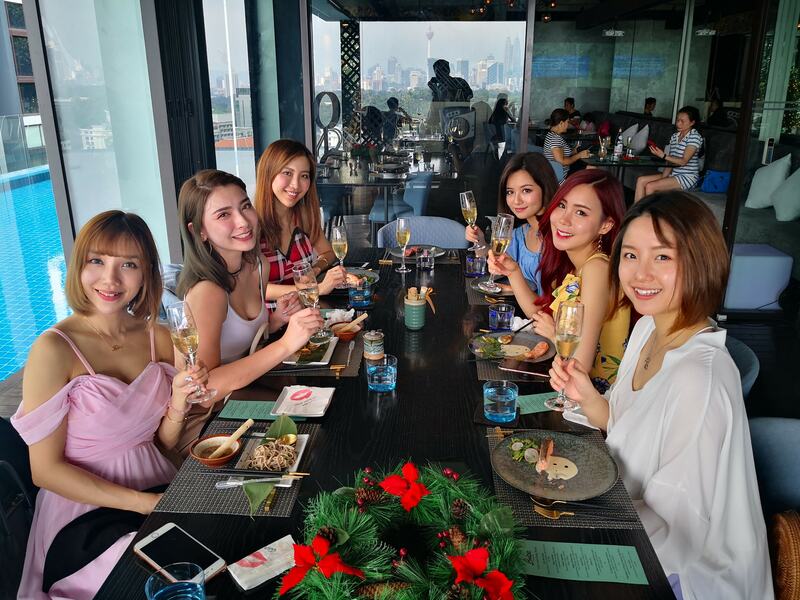 “This is a winning collaboration for Lazada and Shell that first and foremost, benefits the consumers as they now have unparalleled access to a wide range of official Shell Helix products via our platform. Brands such as Shell recognise the strategic importance of e-commerce in Southeast Asia and we look forward to working together with Shell in growing its online presence not just in Malaysia but across the region,” he said. Versace took the opportunity to dress Bruno Mars in his newly released official music video for his hit song “Versace On The Floor”. as well his co-star in the video Zendaya. The video also featured Versace Home Collection silk pillow elements. Bruno Mars wore a custom Versace short sleeved silk shirt, black Versace trousers, and black Versace smoking slippers with gold Medusa emblems. He accessorized his look with Versace necklaces and rings. Zendaya was stunning in a custom-made Versace gold chainmail mini-dress, with long bell sleeves, plunging neckline, Swarovski crystal accents, and decorative exposed zipper down the back. Inspired by her personal style, the collection pays homage to the fashion and lightheartedness of the ‘90s: streetwear fashion that is feminine and cool at the same time. A colour palette of black and white is combined with bright orange and vibrant yellow. Band tshirts and track pants are paired with a fitted wrap top and a short kimono. A tight body, leggings and a sporty top in camouflage print create an urban look. A short wrap skirt and matching jacket fit the ‘90s double denim look. A fan scarf, colourful sunglasses, choker and socks are the perfect accessories to complete the cool looks. 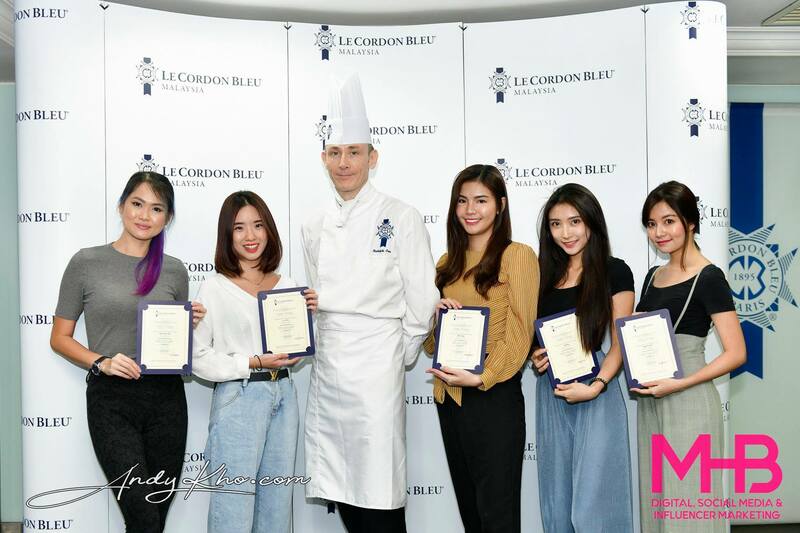 “Working together with H&M was such a great experience for me. I love this collection as it reminds me of my idols and the ‘90s. There is something for everyone,” says Ace Tee about the collection. Ace Tee gained an international reputation a short time after her song ‘Bist du down’ became viral. Ace Tee’s voice and music carry the easy and cool vibe of the ‘90s. With her collection that is being sold online worldwide she follows her vision of a global movement of community. “I am deeply convinced that music and fashion can connect people beyond nationality, gender and age. I am happy if I can achieve the same feeling with my collection,” says Ace Tee. 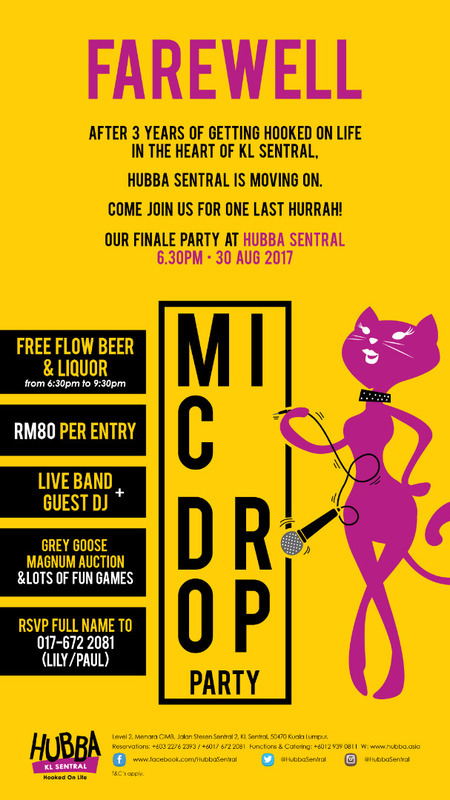 Hubba at KL Sentral will throw a closing “Mic Drop” party this coming 30 August 2017 after three years in operation. During its tenure, the restobar served over 100,000 patrons with its Home Styled Food, cocktails, wines, spirits, beers and gathered quite a loyal following during Happy Hours. 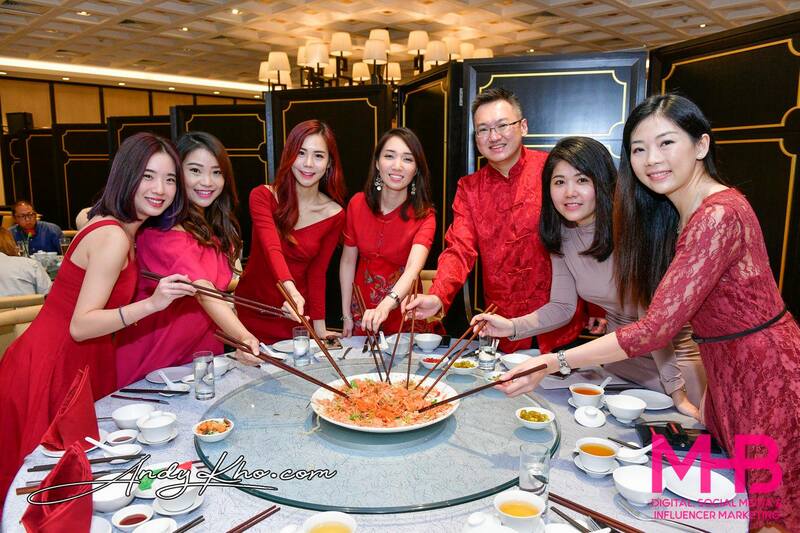 “It’s been a delightful 3 years, we have made many new friends in KL Sentral and we are certainly sad to leave. We will now focus our attention on our other Hubba outlets in Ceylon and Mont Kiara. So those hankering for our scrumptious Lamb Shank Pie or Pommery Salmon can still get their fix there. Do be on the lookout for our all new offering at Hubba Ceylon especially if you love margaritas and martinis! Oh and by the way, it’s going to be called Goa at Hubba….so keep your eyes and ears peeled from now till we relaunch in October. A real spicy affair with an all new food menu and sublime Indian inspired cocktails is in store!” smiles Michele Kwok, Executive Director of Hubba. The Mic Drop party will happen from 6.30pm onwards on Wednesday 30th August where there will be free flow beers and liquor coupled with complimentary canapes and live music from Groovology with lead singer Fara a gold medal winner when she represented Malaysia for the World Vocal Championships in California, USA in 2006. Later in the night, DJ Augie, takes over, and to add onto the fun, there will be an auction for the Grey Goose Magnum bottle and lots of fun games. Mic Drop tickets are priced at RM80++ per person. Call 017 672 2081 to purchase your tickets and ask for Paul or Lily! You will also get a bonus 499 Inner Circle points when you get your ticket today. Inner Circle is a newly launched loyalty programme from Tujo and Hubba. As such, Federal Territories Minister Tengku Adnan Tengku Mansor is asking DBKL not to give out so many free national flags as it’s a waste. For once I agree with him. Don’t give out flags. Don’t waste money making them and enriching some crony either. Hanging or waving a flag does not correlate to how patriotic a person is. 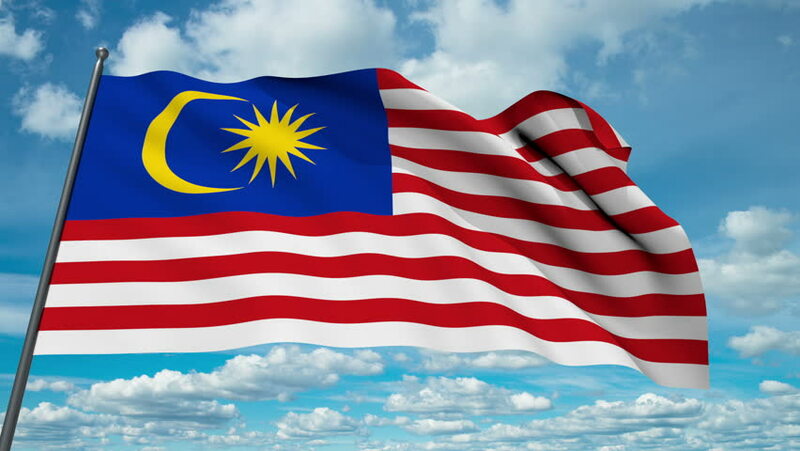 Furthermore, there’s really no reason for KL folk or any Malaysian citizens to be proud of our country as we have been colonised by certain “political parties” who have made the country into a world famous kleptocracy. In fact, I believe most ethical, honest and rational Malaysians feel very ashamed of MO1, his cohorts and their scandals. Let’s be honest to ourselves – the country badly needs change otherwise there is no light at the end of the tunnel and this highly depressing situation will just keep on dragging our economy and society down. The current 1Party “powers that be” don’t care about your quality of life. They only care about enriching themselves. So let’s vote ethical, honest and upstanding people into the federal government to lead our country out of this quagmire that we’re caught in. You owe it to yourself, your parents and your children to do so.